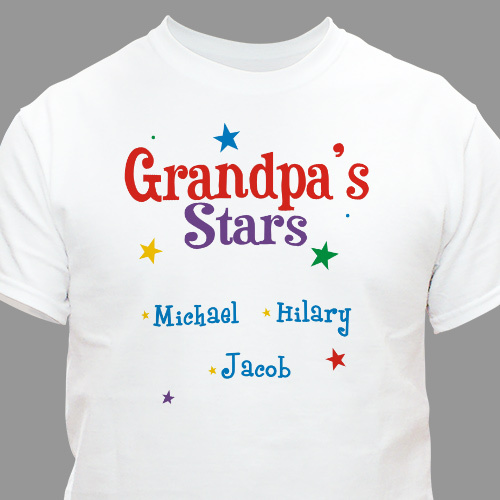 Grandpa's Little Stars will be shining brightly on his Stars Personalized T-shirts. Give him a unique Father's Day Gift that he can proudly wear all around town. Our Stars Personalized Shirt is available on our premium white 100% cotton Personalized T-Shirt, machine washable in adult sizes S-3XL. Also available in Ash Gray. Includes FREE Personalization! Personalize your Shining Stars T-Shirt with any title and up to 30 names. Our Personalized Shirt makes a great Gift for Grandpa anytime of the year and especially makes a unique Fathers Day gift or a special gift idea for Grandparent's Day.